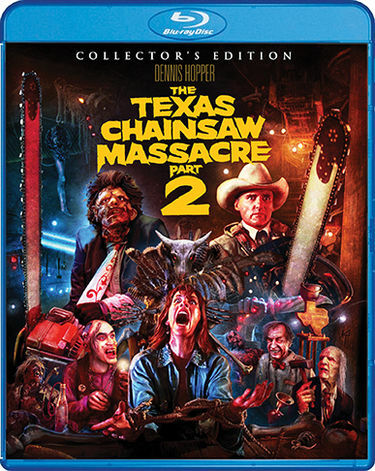 ‘The Texas Chainsaw Massacre Part 2’ Coming To Blu-ray and DVD in April!!! If you’ve been waiting for the right time to purchase a copy of ‘The Texas Chainsaw Massacre 2‘, that time is now, well, in a month. Scream Factory is giving us a collector’s edition of the horror sequel by celebrated horror-master Tobe Hooper. It debuts to Blu-ray and DVD on April 19. This special 2-disc set has over 10 hours of bonus features, including just about 5 hours of exclusive content you won’t find anywhere else. For a decade, Texas Ranger Lefty Enright (Dennis Hopper) has sought to avenge the brutal murder of his kin by the cannibalistic Sawyer family – Leatherface, Chop-Top, The Cook and Grandpa. With the help of a radio DJ (Caroline Williams), who’s also bent on putting an end to the terror, Lefty finds his way to the Sawyers’ underground slaughter shop, where a battle of epic proportions will soon rage… and the line between good and evil gets chopped to bits! Scream Factory Presents Double Feature ‘Troll’ and Troll 2′ on DVD and Blu-ray!!! This entry was posted on Tuesday, March 15th, 2016 at 10:36 am	and is filed under Film, News. You can follow any responses to this entry through the RSS 2.0 feed. You can skip to the end and leave a response. Pinging is currently not allowed. « Scream Factory Debuts ‘Sssssss’ On DVD and Blu-ray in April!! !